The poet comments that the wonder of that night had pleased the merry King Arthur, but that the revelry was soon over, and what followed was a long year and the natural course of the seasons. The poet vividly describes how the country changes from Winter to Lent, the lifting of the clouds and the blooming of flowers in Spring. The Greek god of wind Zephyrus blows on the seeds and the harvest comes. And by these natural turns of the seasons, Michelmas arrives and Gawain anxiously awaits the time when he must set out on his challenge. The poem's descriptions of the changes in nature across the seasons is long and elaborate. By providing such detail of the natural cycles of the year the poet is able to make that time seem long, beautiful, and inexorable—time will keep on passing, and Gawain will have to face his doom. In this way, Gawain can be seen to symbolize all mortal men or women, living their long lives across the seasons, but with death always stepping closer. The Green Knight's game gets connected in this way to nature's "game" of mortality. On Allhallows day near the end of autumn, the King throws a feast for Gawain, who is now a hero. The knights and ladies of the court mourn for his departure, but disguise their sadness with joy and music. Gawain makes a speech to Arthur assuring him that he is ready for the dangers of his journey to find the Green Knight. But despite his outward courage, Gawain feels doubt and worry. It seems that feasts and partying are the only way the court knows how to deal with anything. The Christmas game has turned into a strict covenant, forcing Gawain to face his own mortality, but human emotions like fear are not allowed to be shown at court. Reputation, and preserving it, comes first. In the morning, Gawain is prepared for his quest, dressed in magnificent pieces of armor. The poet describes in detail the particular symbols of chivalry that decorate the armor, especially the five-pointed star, the pentangle, which decorates Gawain’s shield. The pentangle stands for pure, unending truth, and its five points symbolize the five wounds of Christ and the full score of knightly wits and virtues that Gawain has shown. In the center of the pentangle is an image of Mary the mother of Christ, who, the poet comments, should be the joy and motivation for Gawain's journey. The elaborately described pentangle represents the exhausting level of pattern and symbol and superstition in the court of King Arthur. The knights spend hours decorating Gawain in these pictures but don’t prepare him in a practical or emotional way, or even ask how he's feeling. The court’s intense, rigid belief in symbols is itself a sign of the way the court has prioritized symbols above life. The poet comments that Mary, who is herself miraculous, should be the joy and motivation of Gawain's quest, but it's not clear that she really is: he seems to be pushed by reputation. Covered in his symbol-decorated armor, Gawain races out of the court on his horse Gringolet. As he disappears, the knights mourn for the loss of such a noble comrade, who could have been a leader of men had he not been sent off for the sake of a Christmas game. It's ironic that the knights talk of Gawain’s lost potential just as he is heading off on the first real test of his virtues. It is unlikely, if Gawain had gone on living a carefree life at court, that he would have acquired this reputation. Only by leaving this world that is so focused on reputation, by taking action in the real world, can one actually gain reputation. But once that reputation is gained, the knight's seem unwilling to risk it again. Gawain’s first travels towards North Wales, and is soon in low spirits as he must sleep in dark places with only animals for company. He travels on, into the wilderness, described as Godless country, unable to find any sign of the Green Knight. He battles with beasts and serpents and in the height of winter nearly freezes as he sleeps in his armor. Gawain’s journey into the wilderness is a journey out of the confines of the court’s moral code. There are no rules here, no order, and the games of the court have turned into very serious survival tests. It's interesting, then, that the orderless country is described as Godless, as if God is order. Having endured until Christmas Eve, Gawain, near despair, finally turns to Mary. He rides through a strange forest and, among the trees, he prays to find shelter and to be blessed. As he crosses himself, he becomes aware of a castle ahead, beautiful and shimmering. Gawain thanks his protectors, and rides on Gringelot right up to the walls of the dwelling, which are surrounded by a deep moat. He admires the height and complexity of the castle’s towers and, when a porter comes to greet him, Gawain asks for the lord of the house. The porter assures him he is welcome and rushes to find the lord. Again the story is marked by Christian holidays, this one ensuring that the story will come full circle and Gawain’s visit to the castle will echo the Christmas feast of King Arthur’s court. The season's cycle, and each cycle brings man closer to his doom. Though Gawain doesn’t seem to notice the danger, the poet portrays the sudden vision of the castle as a kind of unsteady mirage, making us think that maybe it shouldn’t be so easily trusted. Though it is of course also significant that Gawain only finds the castle when he ceases to trust in himself and his own strength and puts himself in Mary's hands, suggesting that true Christian virtues may not be the boastful courage and reputation prized in Arthur's court but something more humble. The welcoming warmth of the castle seems like the perfect sanctuary for Gawain, but it is a little too perfect to be believed. It is so similar to the poem's opening scenes of feasting rituals and material goods at Arthur’s court, which is uncanny and unnerving. At the same time, as the "beaver-hued" beards suggest, the men of this court have something more authentic and animal about them. They seem less distant from nature. The lord instructs his court to make Gawain welcome, and they shower him with rich bedding and robes. When dressed, he is beheld by the whole court as a Prince. He is seated by the fire and served with a wonderful meal. In response to the court’s inquiries, Gawain admits his identity as an Arthurian Knight. The knights are full of greater admiration because of Gawain’s reputation. They believe he has the power to teach them his chivalrous virtues. Secondly, we are learning to be weary of reputations, which seem to lock their bearers into actions that preserve that reputation above all else, and the fact that this new court has heard of Gawain and base their whole reception of him on that reputation should give some cause for suspicion. His host leads Gawain into a private chamber. The host's wife, the lady of the house, desires to look at Gawain, and comes out of her quarters, followed by other maidens. She is beautiful, even more beautiful than Guinevere, and Gawain notices her complexion, her figure, and many other fair details. An old lady stands beside her, completely the opposite in appearance to the young woman, with a stocky body and ugly features. Gawain bows courteously to the elder, and greets the younger with a kiss. As the lords and ladies continue the celebration, the host entertains Gawain with games. The two women Gawain is introduced to are symbols of youth and age. Just as Guinevere was appreciated in court for her beauty, these women are objects of nature, and show how the passage of time affects even beauty. Note how the lord brings Gawain into a more private, domestic area of the castle, away from the public court life of the feast, and from this point on, Gawain’s trial becomes more domestic, more moral. On Christmas day, the court enjoys more festivities, very like the ones at King Arthur’s court, with music and meals served in order of importance. Gawain particularly enjoys the company of the lady of the house. This holiday spirit carries on for three days. On the last night of their feasting together, the lord takes Gawain aside and thanks and compliments him. He offers him a longer stay but Gawain refuses, saying he must journey on to the Green Chapel and complete his challenge. The lord is pleased to explain that he knows exactly where the Chapel is and will show Gawain when the time comes. The similarity of this court to Arthur’s which was bound in the code of chivalry alerts us to the fact that there is something to learn here, some contrast to discover, plus the fact that the lord of the castle is familiar with the Green Chapel and has perhaps been there before creates a connection between this too-good-to-be-true court and the supernatural quest and the coming showdown with the Green Knight looming over Gawain. So, for the three days remaining until the New Year, Gawain agrees to stay, and to the lord's suggestion that he sleep late the next day and eat with the lady of the castle, while the lord and knights hunt. Furthermore, the host suggests a game – whatever he wins in the hunt in the next three days, he will exchange with whatever fortune Gawain wins at court. Gawain agrees. The men drink and kiss and repeat the bargain before going to bed. Gawain has put himself into another set of rules in this game. There are connections being made in this section between the new host and King Arthur, as he is described as bold and energetic and obviously loves court life, but he’s also reminiscent of the antagonist, the Green Knight, because he is rougher and beardier (to coin a term), and seemingly closer to nature than Arthur. Further the game puts the Arthurian knight (Gawain) squarely in the court, while the lord himself will go to wrestle with nature through the hunt. Parfitt, Georgina. "Sir Gawain and the Green Knight Lines 491-1125." LitCharts. LitCharts LLC, 3 Sep 2013. Web. 18 Jan 2019. Parfitt, Georgina. "Sir Gawain and the Green Knight Lines 491-1125." LitCharts LLC, September 3, 2013. 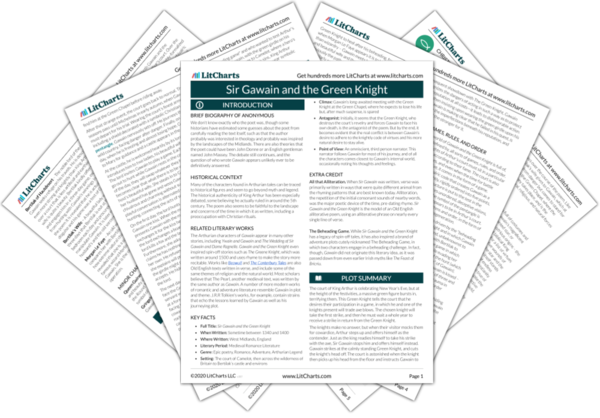 Retrieved January 18, 2019. https://www.litcharts.com/lit/sir-gawain-and-the-green-knight/lines-491-1125.